A few months ago I read a blog post about body language. It linked to some lame video on YouTube that didn’t hold my interest. Before heading off to the next blog, I decided I’d see if there were any good books on the topic. Little did I know I’d stumble upon one of the most amazing books I’ve ever read. Get ready to go shopping, you will want this book. 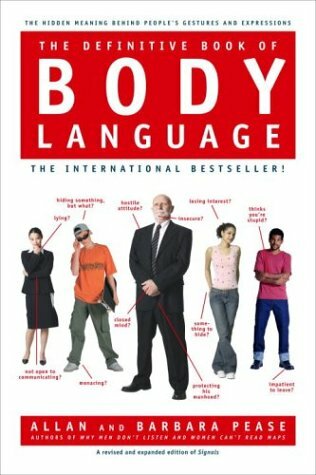 The Definitive Book of Body Language by Allan and Barbara Pease was an eye opener. I can not recommend this book enough. The book covers human body language and all the signals we send out. Have you ever watched a DVD and then went back to watch it again with the directors commentary turned on? The director will point out so much detail with every scene, a lot of which was missed by the viewer during the original viewing. After reading this book, I feel like a director is whispering in my ear a new audio track on life. Body language is the directors commentary on life. The book explains that men are terrible at picking up body language signals. Women are better, but still miss most signals. After reading this book, I went to the Wikipedia and learned common human ancestor goes back 200,000 years, but the first natural language only goes back 50,000 years. Language started out biological. Body language exists whether you notice it or not. Most of the book is spent going through and analyzing different body language signals with drawings and photographs. For example, when a child tells a lie they will often cover their mouth. This signal is also common with adults. The book located a photo of President Clinton during the Lewinsky testimony where he was denying relationships with the intern. He was shown covering his mouth. The book covers hand shakes, face gestures, arm positioning, leg crossing, mirroring, personal space, flirting and much more. Guys will want to read the Thirteen Most Common Female Courtship Gestures and Signals. I guarantee you are missing most of them. Did you notice the lady across from you had her arms folded across her chest? That means she is not accepting you or your story. When she put her hand under her chin it signaled she was critical of your story. And finally about mid-way through your story, I noticed you covered your mouth briefly, which makes me think some of those story details are untrue. The young guy smiled and turned his head slightly down and to the side and smiled. It’s a move done by children in all cultures to gather sympathy, because it triggers a maternal or paternal reaction. The lady across from him then confirmed my analysis of her body language was accurate. Every page in this book is a gold mine of information. I’m giving this book the highest of recommendations. I really like this one as well. It’s great for negotiations specifically — why it’s always better to negotiate in person and/or have the most important of meetings in person if you can (tying it in with NLP techniques). I can’t wait to read it. I learned a lot of this stuff through Anthony Robbins and his and others work with NLP. Have you ever used your body language to manipulate other people? That is the gold, my friend. You’d be AMAZED at how much you can affect other people by watching them and then adjusting your body language accordingly. Manipulate is a strong word with negative implications. A simple smile and raised eyebrows will almost always result in a person responding positively. The book covers techniques on how to avoid poor body language signals you might be sending out. Your emotions will dictate your body language, but the reverse is also true. Your body language will affect your emotions. I read this book quite some time ago. It is very good, however, a bit overwhelming. I already have good gaydar so I read body language pretty well. Problem is the book can be hard to apply because of all the variables even with the clustering and context factors.